You took the ALS Ice Bucket Challenge, but are you brave enough to take a Whole Food Challenge? Fifteen of our neighbors recently did, and what they experienced was simply amazing. In just two weeks, their mood, energy and concentration tremendously improved, and chronic symptoms evaporated! As a research project for school, I recently led 15 people through a brave experiment: dumping processed and refined food for two weeks in favor of only real, whole food. No refined sugars or flours, no chemicals, no MSG, no added junk – just the fuel-injected nutrients that only whole food can deliver. To begin, they listed current health concerns and recorded their regular eating habits as a benchmark. Next, I provided practical educational and support tools to prepare them for the transition. Then, with refrigerators abundantly stocked with whole food, they were eager to get started. Some set out with fierce intentions to comply, while others needed some flexibility. This was fine; I only asked for their honesty. They completed their journey with a questionnaire to capture their experiences. The results were so inspiring to me that I want to share them with you. I hope you’ll find them inspiring too. After just two weeks, most participants experienced HUGE, SIGNIFICANT, or MODERATE improvements in their physical, mental, and emotional wellbeing (see chart). With some slip-ups, compliance ranged from only 54% to 85% (averaging 68%). Even small changes lead to big improvements! Result #2 – How Healthy is Healthy? Before the study, most participants thought they were eating healthier than they actually were. 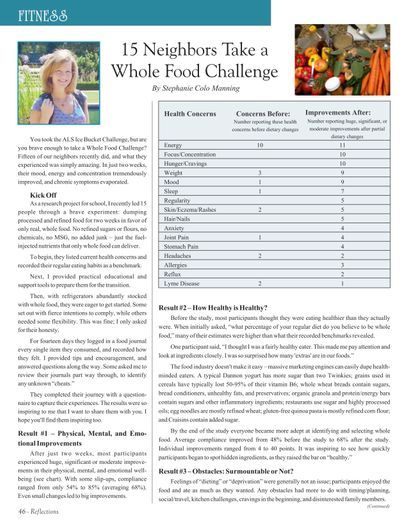 When initially asked, “What percentage of your regular diet do you believe to be whole food?” many of their estimates were higher than what their recorded benchmarks revealed. The food industry doesn’t make it easy – massive marketing engines can easily dupe health-minded eaters. A typical Dannon yogurt has more sugar than two Twinkies; grains used in cereals have typically lost 50-95% of their vitamin B6; whole wheat breads contain sugars, bread conditioners, unhealthy fats, and preservatives; organic granola and protein/energy bars contain sugars and other inflammatory ingredients; restaurants use sugar and highly processed oils; egg noodles are mostly refined wheat; gluten-free quinoa pasta is mostly refined corn flour; and Craisins contain added sugar. Result #3 – Obstacles: Surmountable or Not? Feelings of “dieting” or “deprivation” were generally not an issue; participants enjoyed the food and ate as much as they wanted. Any obstacles had more to do with timing/planning, social/travel, kitchen challenges, cravings in the beginning, and disinterested family members. Most overcame these with new habits and strategies. They said the first few days were hard, but it got much easier. Once they experienced how much better whole food made them feel, participants became even more motivated. When asked, “On a scale of 1 to 5, how likely are you to continue eating a Whole Food Diet?” 11 out of 15 indicated they very much wanted to keep it up and were very likely to encourage family and friends to make changes, too. At the end of the study, I encouraged participants to continue down this road and to be careful about diving back into the bad stuff, as it could make them feel ill. Cleaning up one’s diet reawakens the immune system after years of being numbed. The immune system gets back into the game and tells you what it doesn’t like, helping to prevent conditions from quietly festering. So when one participant jumped into a pile of cookies after the study ended, it wasn’t surprising that she experienced stomach pain and nausea. Her body was finally able to speak to her, and she tuned in to listen. Participants shared these additional words, the majority reporting great successes. “I feel like I'm learning to eat again." Three months later I learned that participants have mostly kept up, or have regressed just a little bit. Any journey worth taking is often two steps forward and one step back. They’re making great strides and conquering the hard truth. Processed and refined food has an incredible hold on our society. It’s a fascinating phenomenon and a real problem. The quarter of the population that eats the fewest fruits and vegetables has double the cancer rate compared with the quarter that eats the most fruits and vegetables (Shari Lieberman, The Real Vitamin & Mineral Book). Yet, the reasons for consuming processed food go deeper than whether or not people know about the health consequences. The food industry has made it too easy for us to rely on their products, and we’ve now found ourselves painted into a corner. Our lives have become full with meaningful work, kids’ activities, caring for family, exercise, volunteering, and more. With many important obligations, we as families have become as addicted to the convenience of processed foods as we have to the artificial flavors and chemicals in them. The hard truth is this: we’re surviving but not thriving. We may think we feel fine because we can’t even remember what great health feels like, or we’ve learned to live with our issues. More than the absence of disease, real health is total mental, emotional and physical wellbeing. Real health is freedom from everyday symptoms that eventually lead to deep-rooted disease. Real health requires real food. This is something you have to want; like anything else you commit to, it’s worth the work. Deep-rooted habits may be difficult to break, but you’ve succeeded at bigger challenges than this. Do a two-week experiment. Prove to yourself that it will make a difference in your life. Once you actually feel the difference, you’ll want to make more changes. Soon it will become easier and you won’t imagine any other way. Be inspired by these real people right in your own backyard – their small changes led to big health improvements. Whether you have minor complaints or more serious issues, be excited for the possibility of feeling better. If you have no apparent health conditions, get ahead of the game – invite more whole foods into your life as preventative medicine. Dump the junk and demand only the best for your family: Fresh, real, whole food. The tide is turning. “Cleaner Food” options are proliferating, while McDonald’s and Dunkin’ Donuts are closing hundreds of stores. It’s a great time to break free from food industry giants. 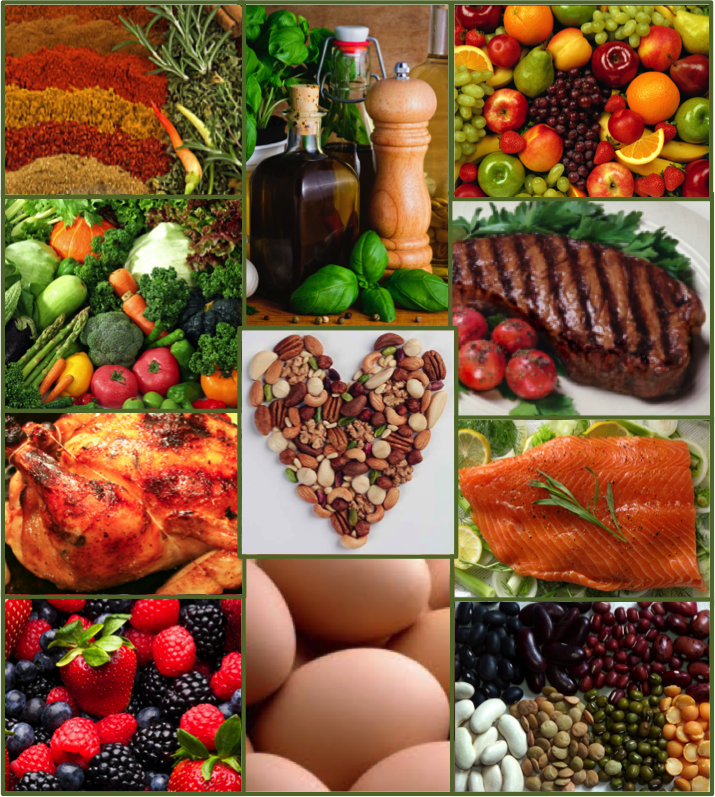 Why not welcome 2016 with a Whole Food Challenge? I’d love to hear from you! 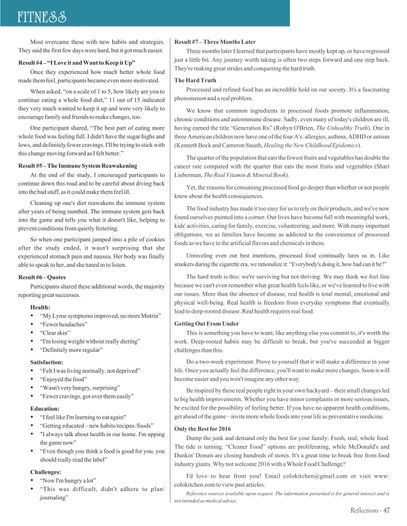 Email colokitchen@gmail.com or visit www.colokitchen.com to view past articles.